As a wide-eyed high school senior, Emily learned about international internships while on a tour of Oregon State’s campus. She was intrigued, and four years later she made her international dream a reality with an internship in Ecuador. Emily is an Honors College student studying public health, with an option in health management and policy. She’s also thrown two minors into the mix — one in business and entrepreneurship, and one in chemistry. To say she’s up for a challenge is an understatement. Why did you want to do your required internship abroad? “I chose to complete my internship abroad because I’m passionate about global health, and I wanted to challenge myself to learn about and work in a culture and health system that’s different from the U.S.
“I’m also on the pre-medical path, so having the opportunity to combine public health work with clinical exposure through my particular internship program really interested me. Where did your internship take you? Was your international internship affiliated with a specific program? What were you doing in Ecuador? “I worked in several urban and rural community clinics, where I learned about public health and the Ecuadorian health care system from doctors and other clinic personnel. In these clinics, I was able to help run community vaccination programs, work with the elderly and improve health literacy among low-income families. I also worked with a vector control program with the Ministry of Public Health and assisted with a long-term epidemiological survey focused on preventing mosquito-borne diseases in the community, especially among low-income pregnant women. 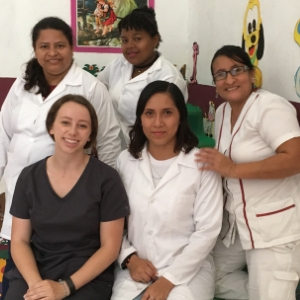 Emily worked alongside staff members at a clinic she interned at in Guayaquil, Ecuador. What was it like interning at Puyo General Hospital? “The structure of my internship meant I was working side-by-side with local physicians every day. This meant I was learning about the realities of the Ecuadorian health care system as they provided care within a public health sphere. “I was able to assist the physicians as I worked in the local community clinics, and I was also able to observe their interactions with patients and their steps toward diagnosis and treatment. When I was in rural clinics this process was especially interesting, as physicians and clinical staff had to work with challenges common to rural areas. “Puyo is a small town in a rural area, so medicine there, especially as performed by the primary care physicians I worked with, actually involved a lot of preventive public health work. For example, some families wouldn’t bring their children in to get vaccinated, so clinic staff visited families who lived in very rural areas in the jungle, educating parents on the importance of vaccinating their children and then providing vaccinations on the spot. What was the most interesting experience you had at the hospital? “The most interesting experience I had was a very eye-opening one, in which I worked with one of the head nurses at the Puyo General Hospital to organize housing and a treatment plan for a patient. This patient was a 17-year-old mother who had arrived at the hospital with an active tuberculosis infection, AIDS and a young child who had been born with HIV. “Her family had shunned her because of stigma associated with her AIDS diagnosis, leaving her in Puyo with no money and no support. We prepared housing for this patient and her daughter, arranged support and developed a long-term treatment plan. “I spent about a week learning about indigenous culture and traditions from members of the Quechua San Virgilio community, which is about a two-hour drive into the jungle outside of Puyo. I learned about medicinal plants and healing practices, as well as how the San Virgilio community works with the Ecuadorian government to maintain their culture and way of life in Ecuador’s plurinational society. Was your internship aligned with what you want to do in the future? “I plan to apply to medical school after I graduate in December, and I aim to become a primary care doctor. I hope to work in global health to improve others’ health and well-being through public health initiatives that remove systemic barriers to care. “My internship experience was definitely aligned with my future goals, since it combined public health work and clinical medicine. I was able to work with a range of populations and cultures, and learned from many diverse viewpoints about health and medicine. What advice do you have for other students considering an international internship? Let’s back up. What led you to major in public health? “I originally didn’t know what I wanted to study, as I was interested in everything when I first started at Oregon State in 2014. At this point in time the Affordable Care Act was going into effect, and I was intrigued. “I was interested in health and medicine, so I took a class called Social and Individual Health Determinants. I had never heard of public health before, but learning about the myriad of ways in which public health work impacts our lives made me want to learn more, so I could work to make others’ lives better in the future. We hear you’re an Honors student as well. Has this enhanced your college experience? “Through the Honors College, I’ve been able to dive into subjects and explore fields that aren’t included in my program of study, but still add to my understanding of the world and enable me to develop new interests. “After my freshman year, I went to Ethiopia through the Honors College thanks to a class about international service. I became further motivated to work in global health after seeing what I had learned about in my classes firsthand, and it challenged me to further develop my understanding of international service, as well as my place in it.